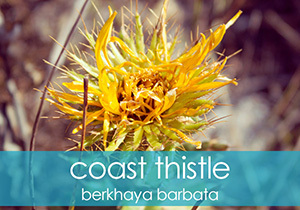 The Berkheya Barbata or Coast Thistle is a beautiful sunflower-like bloom but it’s a nightmare to touch. The leaves are bordered by long, thin thorns whilst the stems and bracts hamper its potential as a cut-flower. This Thistle is a perennial and can grow up to 60cm in height. Plants produce numerous stems to form a dense and entangled shrub that can be found along and over rocks and other vegetation. The younger leaves are usually covered by a protective cotton-like layer that rub off as the plant matures. The leaves themselves are arranged in pairs, up to 60mm long and 25mm wide, bright green and glossy above with white, dense hairy cover below. 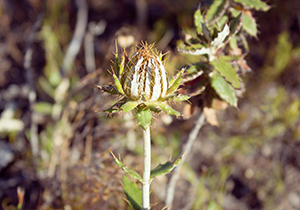 The flower heads can sometimes grow to the size of a hand (around 100mm in diameter) and have an outer ring of bright yellow to orange-yellow petals and a matching centre. 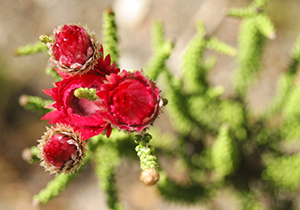 At the end of the flower’s lifespan, the spiny bracts that cover the plant create a protective layer for the seeds. 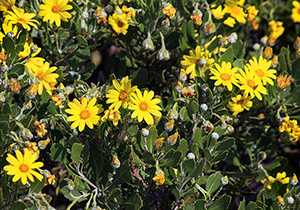 These flowers can be found in harsh, coastal areas as well as in deep sands, rocky outcrops and along cliffs. The Pseudoselago Serrata is a beautiful erect or sprawling shrublet with stout, angular branches that can grow to a height of 90cm, with crowded, hairless leaves about 12-25mm by 5-10mm in size that overlap like tiles along the stem. 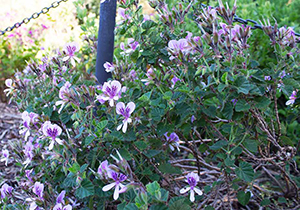 The bright mauve flowers with orange-yellow throat patch are found in dense flowering heads of up to 10cm in diameter. When fruiting, the separate heads elongate to resemble thin heads of barley, each producing a singular seed. These flowers can be seen from October until February and favour cliffs and shrublands. 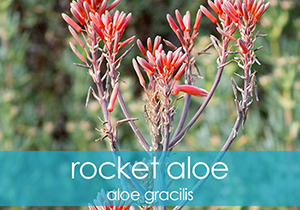 Aloe gracilis is closely related to Aloe striatula, Aloe gracilis has large red flowers, leaf sheaths not as clearly marked as in Aloe striatula. Aloe gracilis can also be easily confused with Aloe ciliaris but one can distinguish the two apart by the fine marginal hair-like fringe that is present on the clasping parts of the leaves on Aloe ciliaris. The specie name 'gracilis' means 'thin and slender' and it refers to the stems. 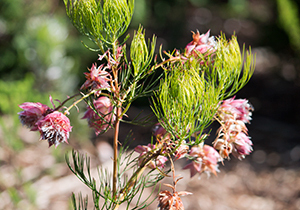 The stems have numerous shrubby semi-erect stems that branch near the ground and can grow up to 2m in height. The leaves are a dull green colour, narrow and erectly spreading, leaf surfaces are smooth with numerous tiny white teeth that are 1mm in height. The flowers/inflorescences are single to twice branched, up to 3m high, raceme is found on the upper third of inflorescence. 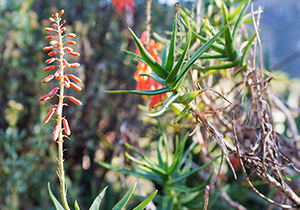 These colourful aloes are easily maintained and require very little maintenance – perfect for a splash of colour or a way to attract some endemic birdlife. 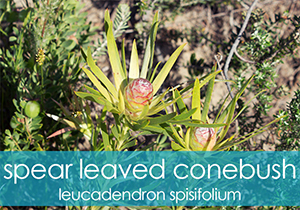 Also known as the common spear-leaved conebush, the Leucadendron Spissifolium flower is a resprouter that can grow up to 1.3m tall, with many hairless stems. 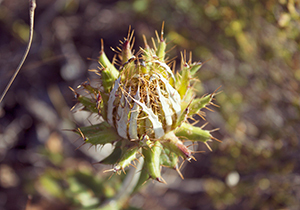 The hairless, red-tipped leaves are slightly smaller on the male plants and are all slightly twisted along the axis. 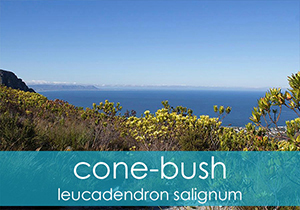 The conebush grows on damp sandy slopes from sea level to 1500m above, usually scattered over a large area (due to it being a resprouter). 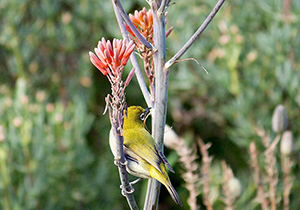 The species has the most extensive distribution in the genus, from the Gifberg to Cape Peninsula, Kogelberg, Elim and the Langeberg. 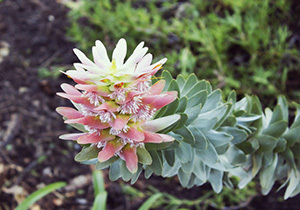 The male and female plants are also discernable by their difference in colour; with the females having a halo of ivory-coloured pointed involucral leaves. Adapted from: Bean, A & Johns, A (2005). 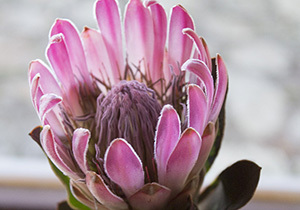 Stellenbosch to Hermanus: South African Wild Flower Guide 5. Cape Town: Botanical Society of South Africa. 164 - 165. 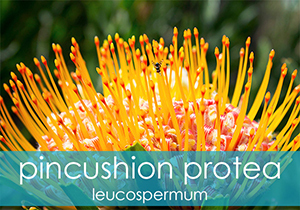 Leucospermum oleifolium is an erect, rounded shrub up to 1 m tall and about 1.5 m in diameter, with a single main stem. The inflorescences are about 4 cm across, in clusters of up to five individual flowerheads at the end of the branches. They open over an extended period of time with the result that one plant provides a colourful spectacle for about four months, from the middle of August to the end of December. The flowerheads open as a pale yellow, which soon turns orange and becomes a brilliant crimson with age. 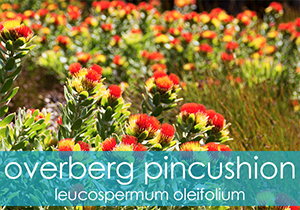 The natural habitat of Leucospermum oleifolium is in the South-Western Cape, from the Du Toit's Kloof to the Caledon Swartberg. The plants often occur in extensive, dense stands, where they protect one another from prevailing winds. 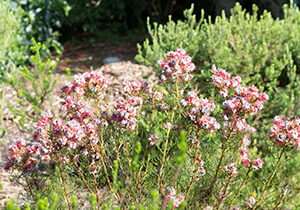 Together with the other fynbos plants a dense cover is established which prevents compaction, keeps the soil cool and reduces the rate of evaporation. 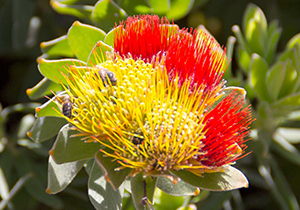 Leucospermum oleifolium is particularly attractive planted in the foreground of a planting with taller Proteaceae like Leucospermum cordifolium, Leucadendron tinctum, or Protea neriifolia in the background. The flowers are excellent as cut flowers in a mixed arrangement. Adapted from: Bean, A & Johns, A (2005). 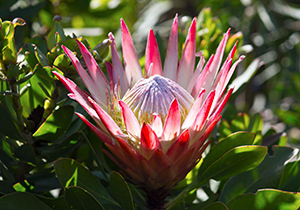 Stellenbosch to Hermanus: South African Wild Flower Guide 5. 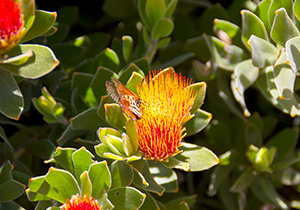 Cape Town: Botanical Society of South Africa. 170 – 171. 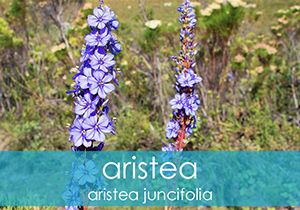 The Aristea Juncifolia is from the Iridaceae (Iris) family, which has 50 species in sub-Saharan Africa and Madagascar, 33 of which occur in the Cape and 17 in this area. Blue (occasionally white), regular flowers, are borne in clusters up a branched or unbranched stem, each flower lasting only one day but several appearing successively over time from enclosing sheaths (spathes), the flower twisting on fading. 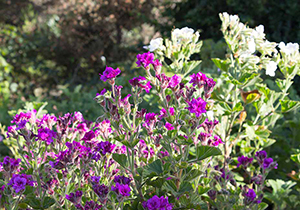 The majority of these flowers are pollinated by pollen collecting bees, open early and are over by about midday. 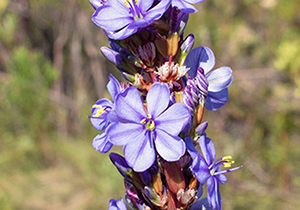 A fairly slender plant with 6 – 11 cylindrical, tough, rush like leaves up to 30cm long, stems round in cross-sections and usually unbranched. 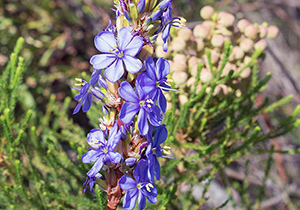 The stalkless dark blue flowers are borne in few-flowered clusters along the stem and emerge from rusty-brown bracts/spathes prominently keeled above and folded along the midline below. 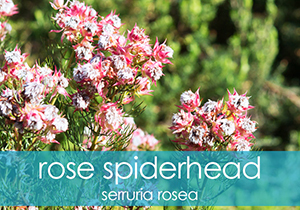 It occurs in sandy mountain soils from Paarl to George between October and January. If you are able to get into the reserves early enough you will be assured a sighting of these beautiful and colourful plants before they disappear at midday. 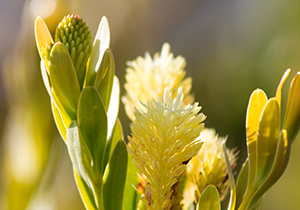 Leucadendron salignum (Golden Tip) is the most widespread species of the family Proteaceae, occurring in a large part of South Africa and on a wide range of soil types, from sea level to an altitude of 2000 m and is quite variable in leaf size as well as leaf- and bract colour. 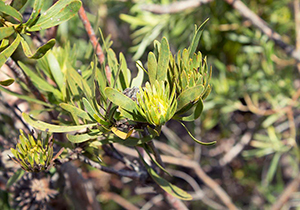 Leucadendrons are dioecious, i.e. 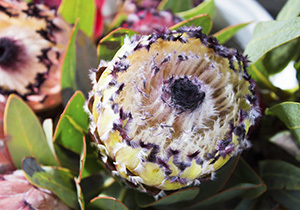 separate male and female plants, which is unusual in the protea family. 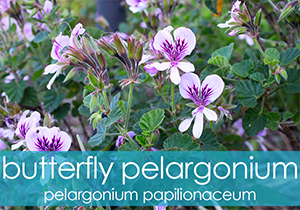 Its long flowering season (May - Dec), coupled with colourful leaves and bracts surrounding the flowers, make this species an attractive garden plant. 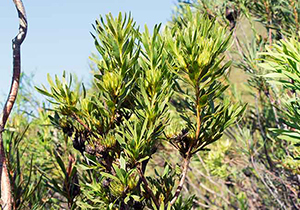 Leucadendron salignum is a multi-stemmed shrub with a persistent rootstock, which enables it to resprout after fire. In its natural conditions it grows to a height of 0.75 to 2 m. The variability of growing conditions, from mild winter temperatures to snow and frost near mountain tops, as well as the variability of leaves and bracts, from greenish-yellow to vivid orange-red, have made this species an excellent candidate for breeding. In addition, this species adapts well to vigorous pruning, which makes it suitable for the production of cut foliage on a large scale. 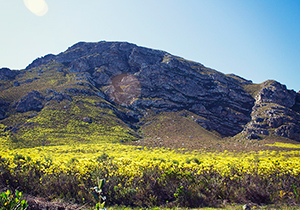 This beautiful flower colours most of the Fernkloof Nature Reserve in a yellow blanket, giving the mountain a constant glow. 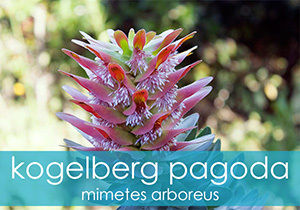 The Mimetus Arboreus is a very rare flower; is confined to the Kogelberg Range (including Fernkloof) and is usually encountered as a single plant, although small subpopulations are also known to exist, however they never exceed 100 individuals. The Arboreus prefers a wetter climate, being found mostly in heavily shaded and marshy areas. Its rarity is due to the Subpopulations declining because of frequent fires, to which the species is susceptible as it is a reseeder and takes eight years to reach maturity. The deliberate exclusion of fire for many years may not have had a totally beneficial effect because periodic fires are needed to ensure recruitment. 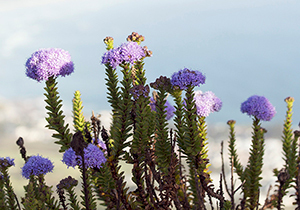 The Arboreus is recognised by its silvery broad leaves that grow in a circular pattern up the entirety of the plant’s stem, ending in a colourful bloom of roughly 15cm in diameter. 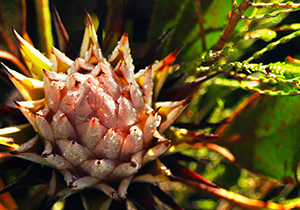 The bloom itself is usually a pink-and-green flower, with fronds protruding from the spaces between “layers”. 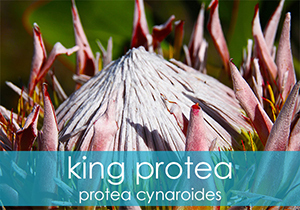 This stunning flower can be found within the Fernkloof Nature Reserve and is a spectacle to behold, if you’re lucky enough to stumble upon it during your walks/hikes. Hilton-Taylor, C. et al. 1998. 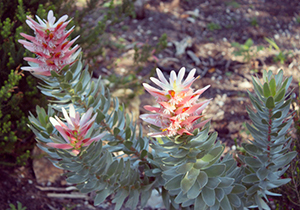 Mimetes arboreus. The IUCN Red List of Threatened Species. Version 2014.2. <www.iucnredlist.org>. Downloaded on 06 October 2014. 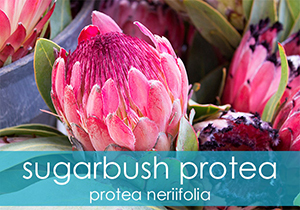 The Protea Nerifolia (also known as the Sugarbush Protea) has a distinct growth pattern, with a 3 meter high “trunk” from which the flower blooms. The lower bracts are papery and eventually curve backwards like wood shavings as they go higher up. The blooms themselves vary in colour from pure white to light pink to deep red, with a distinct white or black fringe (which resembles fur) along the tips of the petals. These colourful petals work as a shield, protecting the inner flowers from the harsh environment. 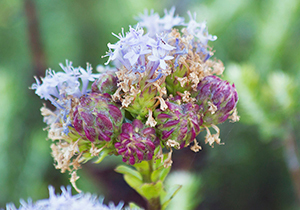 These flowers are a beautiful addition to any garden and play a large role in the creation of bouquets and arrangements due to their diverse colours and interesting fur-lined petals. Adapted from: Bean, A & Johns, A (2005). 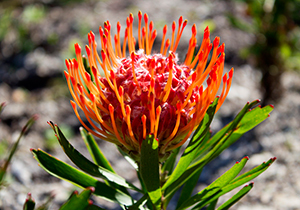 Stellenbosch to Hermanus: South African Wild Flower Guide 5. 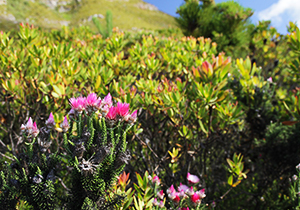 Cape Town: Botanical Society of South Africa. 158 – 159. 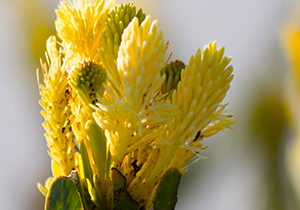 The bright yellow Crysanthemoides monilifera, which means “yellow flower bearing a necklace” (thanks to the green-red berries that grows below the blooms) is a beautifully bright shrub that can grow up to 2m in height and blooms all year round, with the most blooms being seen around Autumn. 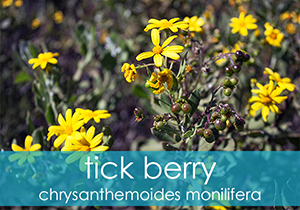 Due to the edible little fruits that it produces this flower is easily spread through bird and animal droppings, helping to coat most of the mountain side in these daisy-like flowers. 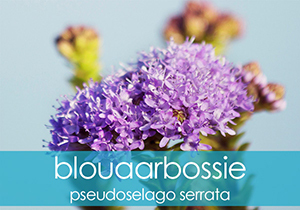 Although pretty to us, this plant is seen as a nuisance in other countries due to its fast growing nature. All we know is that it adds much needed colour in the winter months and a great addition to your home garden! 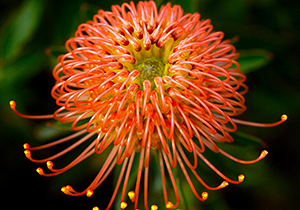 Leucospermum (Pincushion, Pincushion Protea or Leucospermum) is a genus of about 50 species of Protea that are indigenous to the South African Coastline. 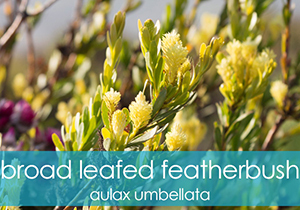 These shrubs are evergreen and have been known to grow to 5m in length. The leaves are spirally arranged, tough and leathery, simple, linear to lanceolate, 2-12 cm long and 0.5-3 cm broad, with a serrated margin or serrated at the leaf apex only. 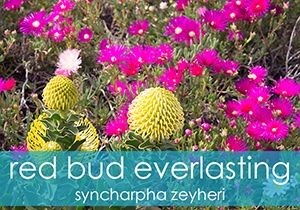 The flowers are produced in dense inflorescences (seperate buds within the flower bud), which have large numbers of prominent styles, which inspires the name. Information has been adapted from Wikipedia.